What is the epicanthoplasty (correction of the epicanthus)? 1) The epicanthus with vertical skin shortage and tension on upper medial eyelid, 2) The epiblepharon with loss of crease on the rest upper eyelid. 3) Skin fold on lower eyelid. The main part of the eyelid evolution is the bulging epicanthus of upper medial eyelid. The upper medial eyelid bulged with soft tissue toward eyelash, directing inferomedially to the medial canthal ligament along the rudimentary supratarsal crease. Under the skin of epicanthus, there are dense fibrous tissues and various amounts of orbicularis oculi muscle fibers. The second part is the skin fold on lower eyelid inferior to medial canthal ligament. Skin fold and related wrinkles on lower eyelid are formed by pulling-up traction mechanism. The last part is the epiblepharon lateral to the point S ,which formed after loss of mid-lateral supratarsal crease and displacement of orbicularis muscle like the epicanthus. In short, the epicanthus is a resultant manifestation by atrophy and fibrous degeneration of hypertrophied orbicularis oculi muscle after the active processes of the eyelid evolution. Fig. (Left) A Caucasian eyelid on strong frowning who has hypertrophied orbicularis muscle., Notice angular point (point S) on which sheer stress is concentrated. 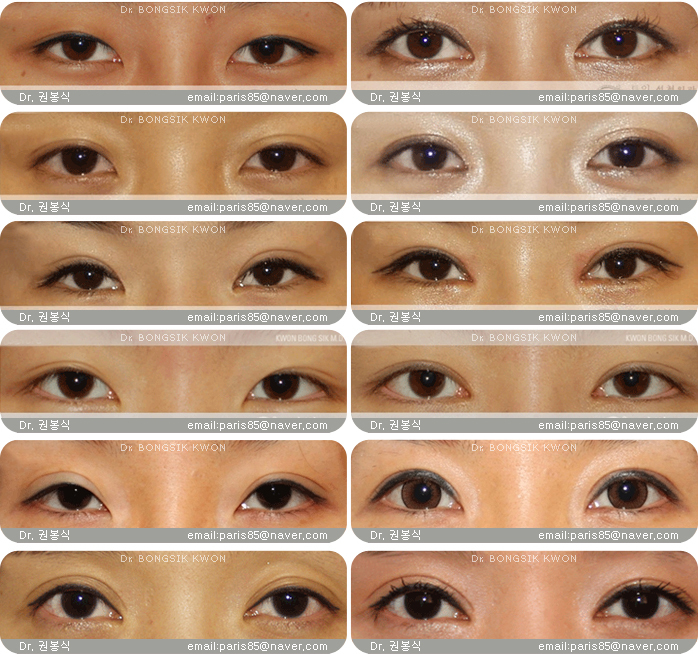 (Middle left) Asian single eyelid on strong frowning (Middle right) Relaxed eyelid with drawing of supratarsal crease. (Right) Open eyelid with crease formation by stick. Von ammon first used the term 'epicanthus' in 1860. For exact understanding about the evolution of eyelid, we need to define correctly the term “epicanthus” which means epicanthus itself with or without skin fold on lower eyelid equivocally. So far the epicanthus means“a vertical fold of skin over the angle ofthe inner canthus”. The expression word-‘fold’-is not good. And the commonly used term ‘epicanthal fold’ is inappropriate to describe the condition of Asian epicanthus. It may mislead plastic surgeons to understand epicanthus as a fold. When we describe skin fold on lower eyelid-‘Epicanthus-related skin fold of lower eyelid’-is a more appropriate term considering its location.The epicanthus-related skin fold on lower eyelid is just skin fold by traction force which resulted from pulling-up of origin point during contraction of preseptal orbiculraris muscle. Formation of prominent fold on the lower eyelid is an ancillary manifestation which is formed between formation of epicanthus and complete loss of supratarsal crease over time. Formation of epiblepharon is consequent to loss of mid-lateral crease and displacement of orbicularis muscle. The epiblepharon is a continuous structure with epicanthus in the upper eyelid and consists of the same composition as the epicanthus. The epicanthus and epiblepharon are purposeful structures of the evolutional process for eye protection, but the skin fold on lower eyelid is an unnecessary by-product. If we include the epicanthus itself and skin fold on lower eyelid into the meaning of ‘epicanthus’, the epiblepharon should be included also in the evolutional aspect. The epicanthal skin tension is considered as a major factor which inhibits the sustainability of surgical crease in Asian double eyelidplasty. Also, the malpositioned orbicularis muscle can be reactivated as a vertically acting inhibitor which causes active tensional stress on mid-lateral surgical crease, especially when we have performed the outfold type double eyelidplasty without epicanthoplasty. Dr. Kwon reconsidered basically without stereotype for the epicanthus. As is the standard for all evolutionary adaptations, the human muscle system would evolve in its efforts to increase survivability. It is clear that the evolution of eyelid muscles are based upon how humans operated in the relevant environments. Anthropologists had already presumed the strong UV, Siberian cold, yellow dust of northeast of Asia as causes of the epicanthus. There would be strong repeated contraction of upper orbicularis muscle and depressor supercilli muscle in Asian eyelid for frowning. Excessive muscle contraction would be inevitable action for protection of eyes from environmental harshness. Environmental adaptation would be a basic cause for formation of the epicanthus. Fig. The stage of the eyelid evolution according to the main action of orbicularis oculi muscle in Kwon’s theory. Loss of medial crease, formation of the epicanthus, loss of mid-lateral crease, formation of the epiblepharon occur in sequence. as tensional stress on remaining aponeurotic fibers and medial crease. In conclusion, the epicanthus is a remnant manifestation of eyelid evolution which resulted from hypertrophy of upper orbicularis muscle and related aponeurotic attenuation.Increased blood supply induced by hypertrop hied orbicularis muscle and climate factors would cause hypertrophy and pseudoherniation of preaponeurotic fa t. Displacement of orbicularis muscle and fat pad would affect the levator muscle and Muller’s muscle. A relativ ely longer medial canthal ligament and underdeveloped nasal bone would be additional evolutional manifestation ​s by hypertrophy of the orbicularis oculi and excessive tension. Under this theory, the main purposes of Asian ​epicanthoplasty would be the anatomical restoration of medial canthus and eyelid soft tissues which are basic for double eyelid formation in Asian eyelids.We could apply the devolutional concept which reverses evolutional processes in Asian epicanthoplasty. 01What is epicanthoplasty (correction of epicanthal folds)? Epicanthoplasty is the name of the surgery that corrects epicanthal folds that cover the inner corner of asian eyes, so that your eyes look more open and become more refined and bigger. For those who have a wide distance between eyes or has small eyes, or looks severe because of inclination of the inner corner of your eyes by a epicanthal fold, the epicanthoplasty is helpful. When it is performed with a double eyelid surgery at the same time, the horizontal length of eyes can be extended and the interepicanthal distance will also be narrowed effectively. 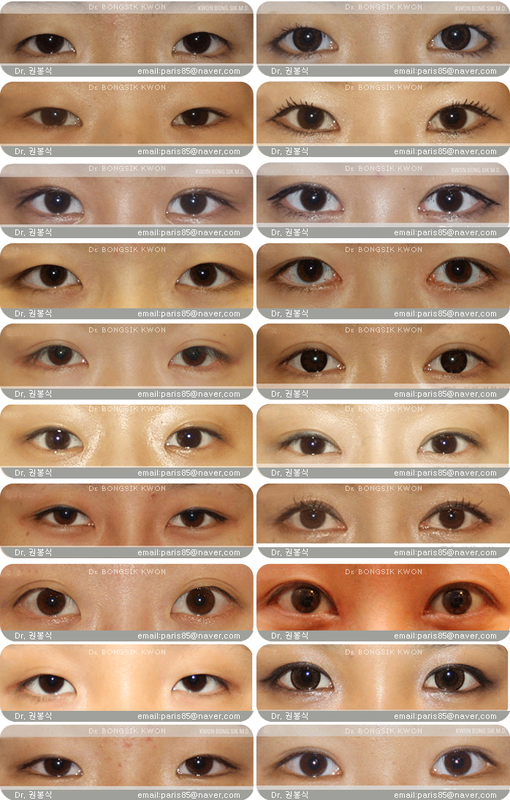 Also, attractive and refined double eyelids will be created by improvement of the epicanthal folds. Double eyelidplasty is the most frequent cosmetic procedure for Asians, and the epicanthus was a conundrum which limit cosmetic result of double eyelidplasty. Double eyelidplasty without epicanthoplasty tend to be unattractive or unnatural. Aesthetically, the epicanthal fold is worsened when performing double eyelidplasty without epicanthoplasty, because double eyelid formation aggravates vertical tension on epicanthal skin. It has been a long-standing dilemma for plastic surgeons which procedure to choose, i.e. infold type double eyelidplasty with a less satisfactory result or outfold type double eyelidplasty with concomitant epicanthoplasty, taking risk of hypertrophic scar in Asian eyelid. When the epicanthal fold is severe, the surgical incision of skin flap also become longer, and a scar could be easily visible in conventional method, which based on the concept of local skin flap and lacked a consideration of upper orbicularis muscle and vertical epicanthal tension. 02What is Kwon's method (Devolution epicanthoplasty=Magic epicanthoplasty)? The clinical significance of epicanthal fold is mainly related with double eyelidplasty in Asians. Epicanthal fold is worsened when performing double eyelidplasty without epicanthoplastyas double eyelid aggravates tension on epicanthal skin. And aesthetic results of double eyelidplasty without epicanthoplasty tend to be unnatural or unattractive.When performing out-fold type eyelidplasty without epicanthoplasty, prolonged swelling retention(so-called sausage phenomenon) occurs due to blockage of lymphatic flow by vertical tension and fading away of double eyelids are frequently noted.Unless the epicanthoplasty releases skin tension and remove potential inhibition factors of crease loss, the surgical crease will not look natural or not be able to last in any enduring fashion. In the early days of epicanthoplasty surgery, numerous surgical methods were introduced to correct the redundant skin fold which were based on the concept of local flaps. However, their disadvantages such as difficulty in design and resultant prominent scars had limited their use. Recently new epicanthoplasty methods have been introduced to correct Asian anatomical differences such as excessive skin, abnormal skin tension, a malpositioned orbicularis muscle, fibroadipose tissue, elongated medial canthal ligament, etc. However, none of them could be a treatment of choice as they lacked exact understanding regarding the malposition of upper orbicularis muscle and vertical skin tension in relation to the double eyelid. The surgical methods based on defective/inadequate understanding of the true nature of the epicanthus could not be sufficiently effectivefor Asian eyelidplasty. 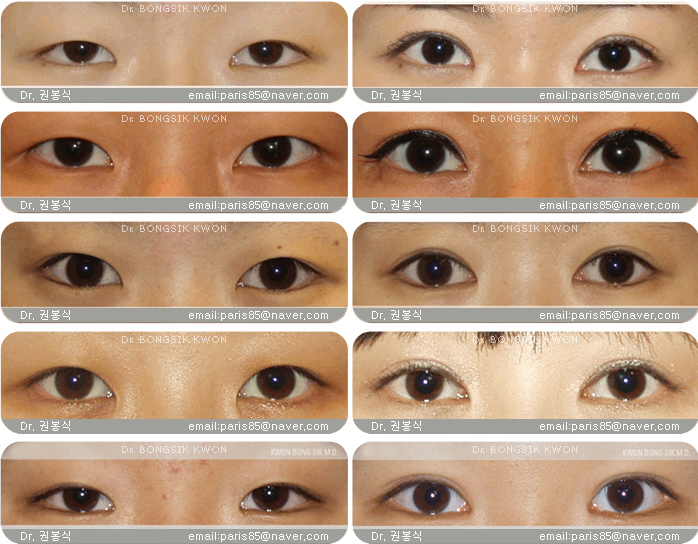 Epicanthoplasty using devolutional method(Kwon's method) was developed on the basis of our understanding of epicanthal formation and causal relationship with double eyelid. Therefore, it is a completely new technique first made by Dr. Bongsik Kwon. This method is also called the magic epicanthoplasty. With good reports and reputations by people who have already undertaken this, it is becoming a term that is commonly used in Korea and in many other countries. It can be surely said that when the problem of epicanthal folds are properly solved, the expression of the eyes changes into clear and beautiful looking eyes in aesthetic aspects. "I usually hear that I glare at people too much." "My eyes look stuffy even after taking the double eyelid surgery"
"People say my eyes look gathered in, but an eye specialist says "I'm not a squint." "I have small eyes but want them to be wider and bigger." These are probably the main complaints from the people who have severe 'epicanthal folds'. However, many women have hesitated to take epicanthoplasty because of some supposedly “negative reputations” and permanent scars. When a scar is deep, it cannot be concealed even on top of make-up.This may be a serious concern. So far, most conventional methods of epicanthoplasty have carried prejudice and negative reputations. If beautiful double eyelids were achieved with a very minimal scar, no one would hesitate. Through consistent results and high satisfaction by people who already underwent devolutional Asian eyelidplasty, the magic epicanthoplasty and combined Asian eyelidplasty has changed negative reputation of the epicanthoplasty positively. We believe that the magic epicanthoplasty(Kwon's method) performed in Teuim plastic surgery can help people who want to have a wide and beautiful expression of eyes. 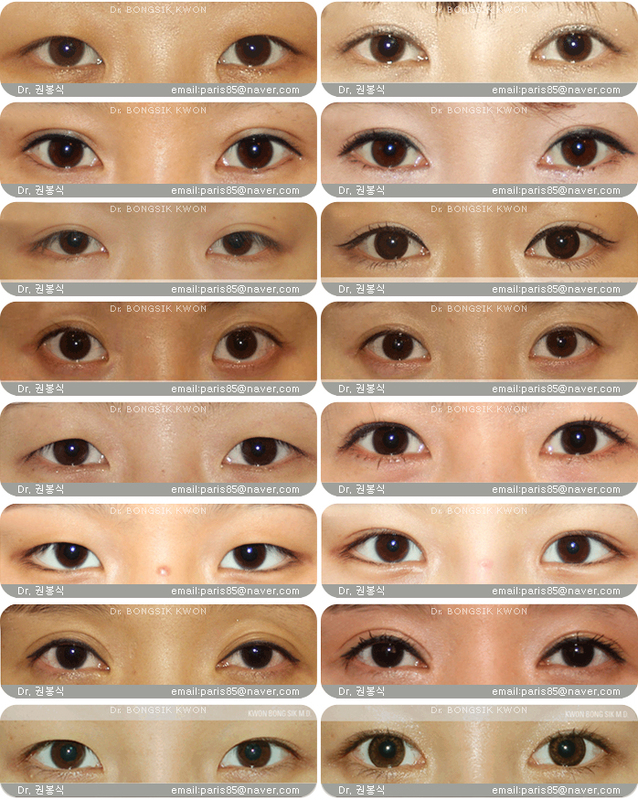 The epicanthus is a characteristic of the Asians which forms small, stuffy or unfavorable eyes. 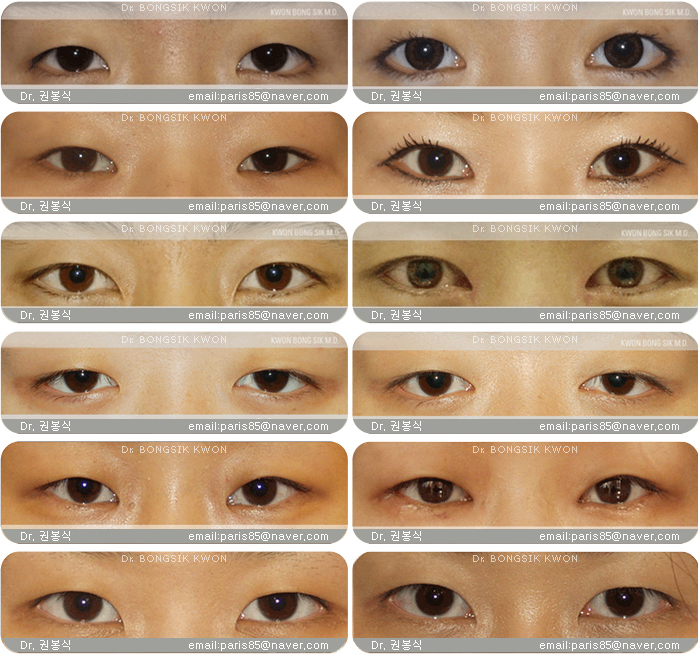 Good candidates of Asian eyelid surgery are determined by the degree of the epicanthal folds. Performing double eyelid surgery on Asian eyes without properly managing the epicanthal folds causes unattractive results or can be a critical reason for getting your double eyelids to fade away. In fact, most of the problems after Asian double eyelid surgery are caused by the tension of the remaining epicanthal folds. Considering previous history of Asian blepharoplasty, epicanthal folds have been an important key, but it had not been corrected properly because of defective methods. Most women say "I want to have beautiful and clear eyes", or "I want to have bigger eyes and bigger crease after surgery" during surgery consultations. However, if a person who has severe epicanthal folds, small eyes and a wide interepicanthal distance, take only double eyelid surgery itself, the surgery can result in a unfavorable appearance by the skin covering over the epicanthal region. 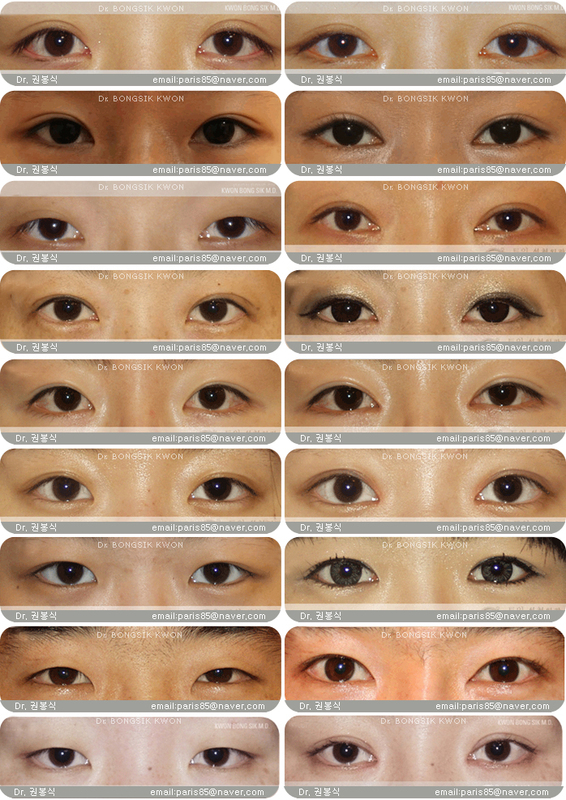 In case of less severe epicanthal folds, the double eyelid surgery alone can possibly make relatively desirable and favorable lines, but only an in-folder type of small double eyelid will appear after all. If surgeons understand evolutional relationship between the epicanthus and the supratarsal crease, epicanthoplasty should be considered the basal surgery for Asian double eyelidplasty, as there is close relationship between loss of supratarsal crease and development of the epicanthus and epiblepharon. ​Considering the relationship of the epicanthus fold and double eyelid, these combined surgeries can generate a perfect plan and create dramatic results. There are many differences in devolutional eyelidplasty from conventional eyelidplasty without devolutional concept. The epicanthus and epiblepharon is same manifestation except their location. Both are composed of preseptal orbicularis muscle and degenerative fibrous tissues which replaced the room of atrophied orbicularis oculi muscles. There are more incidence of mild blepharoptosis in Asian eyelids. We think mild blepharoptosis in Asian eyelid is related with the eyelid evolution. After the evolutional process, the loading conditions of levator muscle had been worsened. The fibrous tissues within the epicanthus and the epiblepharon, vertical skin tension on upper eyelid, hypertrophied orbicularis oculi muscle and hypertrophied preaponeurotic fat pad add levator and muller muscle more loadings, and act as causal factors of blepharoptosis. We can experience the improvement of mild blepharoptosis after devolutional epicanthoplasty often.When we evaluate blepharoptosis, we should consider the epicanthus related factors. When we perform blepharoptosis surgery with devolutional epicanthoplasty simultaneously, correction of blepharoptosis become complete and is expected to get better result. Also in devolutional eyelidplasty, destructive procedures on surgical crease for stronger adhesion is less necessary. 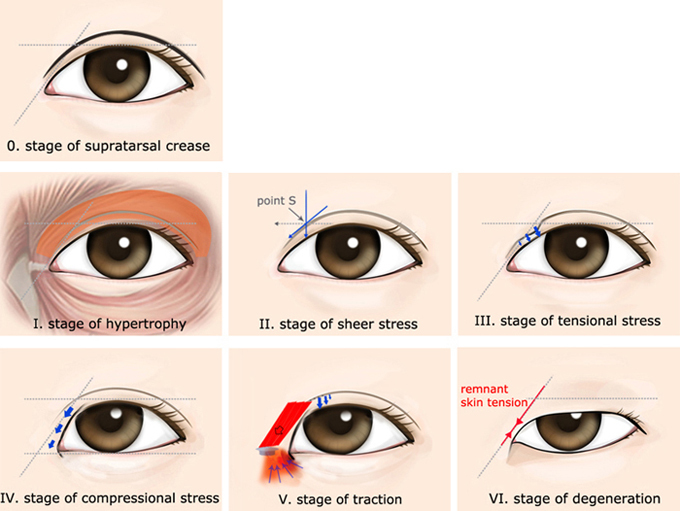 The tensional stress on crease by vertical skin tension is main cause of crease loss after double eyelidplasty in Asians. Contraction of malpositioned orbicularis oculi muscle in vertical direction is also a potential cause of tensional stress on surgical crease. Because we have resolved the possible causes of crease loss with devolutional epicanthoplasty, aggressive adhesion which performed in conventional method is less necessary. In more cases, we can apply non-incisional method for crease formation except excessively thick skin condition with true epiblepharon. We think that we need to review conventional procedures of Asian blepharoplasty and theoretical background for adjusting to devolutional Asian blepharoplasty appropriately. 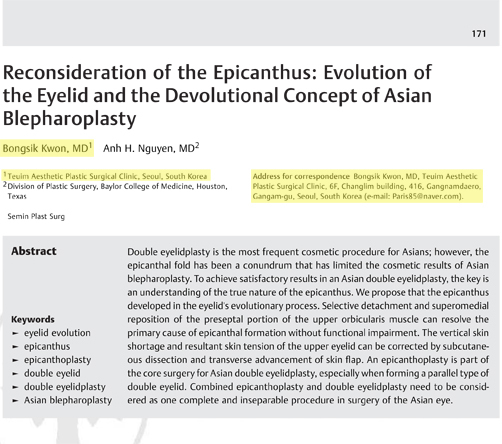 If we agree with the eyelid evolution and understand about the epicanthus in relation to double eyelid better, Asian double eyelidplasty would need to be refined more in combination with epicanthoplasty under devolutional concept. Recently, through the foundation of the Magic epicanthoplasty, it is unnecessary to hesitate doing epicanthoplasty. Magic epicanthoplasty plus double eyelid surgery, these two combined methods tend to be the firm basic concept for the plastic surgery of Asian the eyes. Magic epicanthoplasty combined with a revisional double eyelid surgery in a patient with severe epicanthal folds. 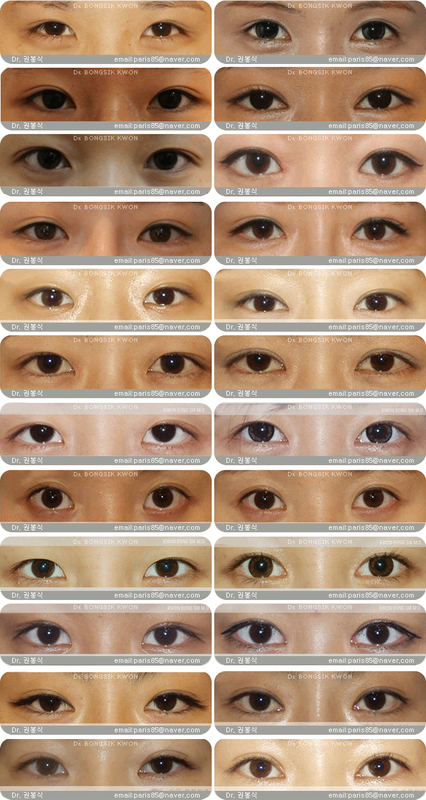 05Would it be possible to only take the magic epicanthoplasty, or should I have to take it with the double eyelid surgery? Although Magic epicanthoplasty and double eyelid surgery require different surgical procedures and are different surgeries but, undertaking both surgeries concomitantly can give you great results. You must be noted that the heads of your eyelids have epicanthal folds , and the rest eyelid on which f double eyelid is formed, is a continuous unit of skin. 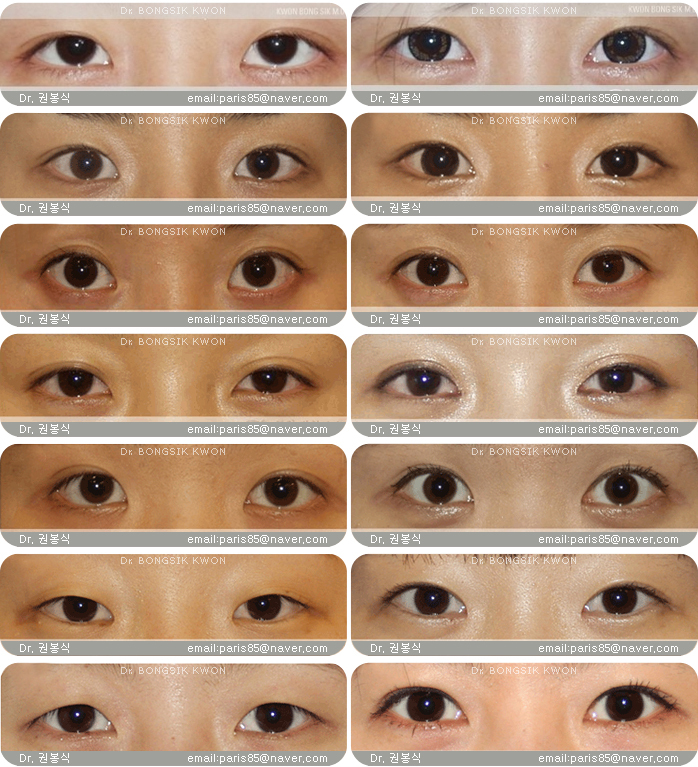 Magic epicanthoplastyalso can be performed either to the innate double eyelid or to the surgically made double eyelid. 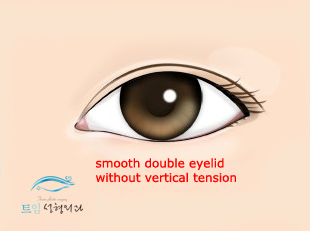 In this case, partial correction of the double eyelid line near the epicanthal angle(corner) can be required to expose the double eyelid more clearly. Magic epicanthoplasty is also possible to be performed on a single eyelid, and if needed, the double eyelid operation can be done later. However, in most cases of a single eyelid, these two combined surgeries are recommended at the same time. 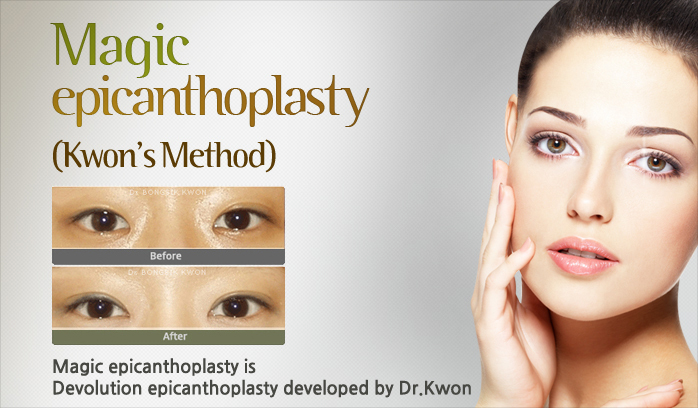 Magic epicanthoplasty is a definite method that can achieve the effective lengthening of eyes in horizontal plane. Considering the relationship between epicanthal folds and double eyelids, combined procedures can be a best choice to express dramatic results. 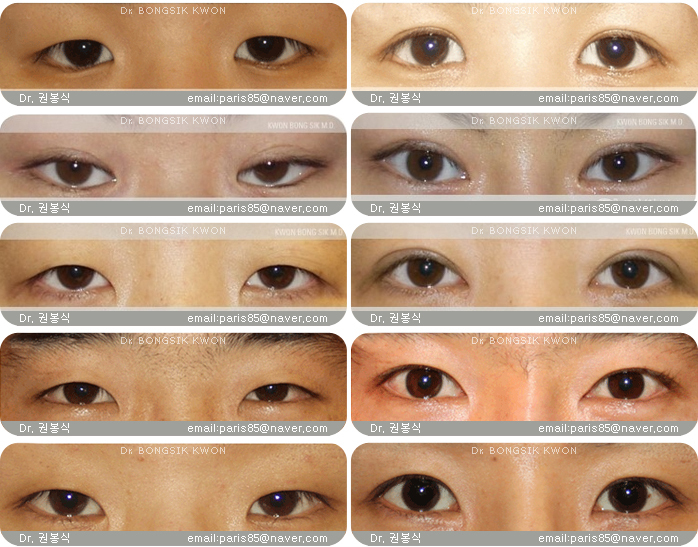 Example) case showing unnatural double eyelid lines when only undertaken an out-folder type double eyelidplasty without epicanthoplasty previously. Magic epicanthoplasty combined with partial correction of inner double eyelid line can acomplish refined double eyelid line at the inner corner region. 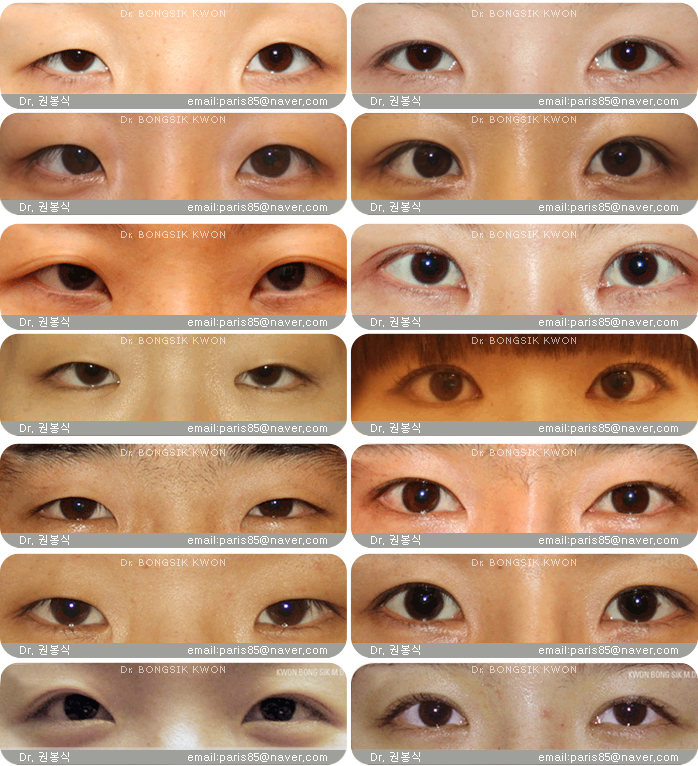 Example)A case showing asymmetric and faded double eyelid lines when only undertaken an in-folder type double eyelid surgery without epicanthoplasty previously. 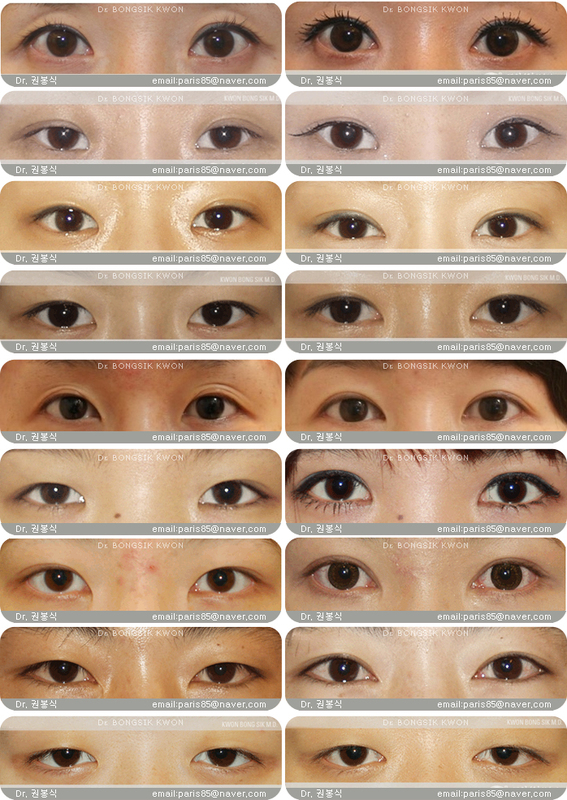 Magic epicanthoplasty combined with revisional double eyelid surgery can acomplish refined double eyelid line. Example)Magic epicanthoplasty combined with a revisional double eyelid surgery in a patient with severe epicanthal folds. 06Is Magic epicanthoplasty different from the conventional methods in terms of its effects? previously using methods are operated by various techniques such as simple excision (Hiraga's method) and the z-plasty, W-plasty etc. However, they all belong to the same category in that the surgeons eliminate a partial skin of the epicanthal fold and suture each side. As a result, a scar after surgery may remain and there was limitation in surgical effect. When the epicanthal fold is severe, the surgical line also becomes larger, and a scar can be easily noticed. Magic epicanthoplasty(Kwon's method), is a new concept of surgery that repositions pericanthal soft tissues and releases the tension. It leads the soft tissue to be redistributed spontaneously by itself without further surgical manipulations. It was developed on the basis of Kwon's theory through the careful study of the epicanthal fold. In the respect of the effects, it can extend the width up to 3mm each eye (if one has severe degree of epicanthal folds,) and can also lengthen and expose the inner corner of your double eyelid line. A great advantage of magic epicanthoplasty is that the scar is not visible on the region sutured. Besides, this method is not a method of surgical excision. It is rather accomplished by rearranging the soft tissue without a surgical excision, so there is no worry to feel drawn back and tensed around the remaining scar. That is, of course, a scar is necessarily made by a suture tension but, the problem of a scar was solved through resolving the tension of skin as much as possible. What are the differences between Magic epicanthoplasty and existing surgeries in detail? Improvement of accessory wrinkles around the fold and dark circles by releasing skin fibrosis on lower eyelid. Restoration of horizontal axis of lower canthal line from slanted shape, between punctum and canthal angle. In magic epicanthoplasty, surgical scar is almost invisible, a scar is hardly seen after removal of the stitches. The scars are not visible after wound healing. With a new concept that is different from the existing methods, it is unnecessary to worry about a scar. In conventional methods, a scar lasts longer and the permanent scar will be unavoidable. However, magic epicanthoplasty, is not a method by excision and suturing the skin, but a method incision and rearranging the soft tissue and skin to lead the cnathus to be restored by itself which can achieve natural-looking refined eyes. After the magic epicanthoplasty, it is unnecessary to worry about your eyes becoming sharper or pointing downward. In Teuim plastic surgery, we perform epicanthoplasty by making the corner of your eyes direct in the comfortable horizontal angle, with the consideration of the overall inclination of eyes. Extreme carefulness and deleate skills are needed to operate the devolutional epicanthoplasty. We must prudently consider the proper skin tension condition of a patient at surgery. We do not perform the same operation to all patients. 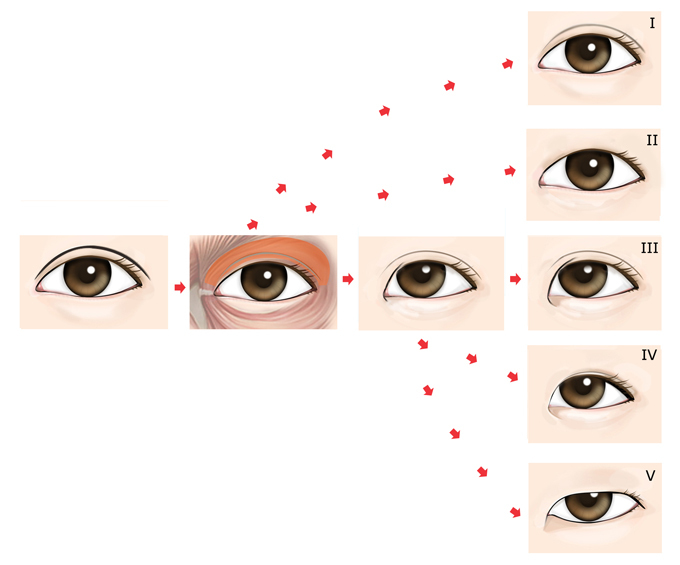 We must consider the type of epicathal fold, and additionaly the shapes of the double eyelid line or expression of eyes a person wants to obtain. According to the condition of each case, procedures are applied to the individual's eyes to make the best result bythe most suitable way for the patient. That is why the surgery takes roughly an hour. The asymmetry of the eyes caused by the difference of the epicanthal fold is improved. By removing the inclined epicanthal folds in the upper eyelid, the overall inclination of the eye looks reduced. Reinforcement of love-bands(a thickened portion on lower eyelid margin)by hypertrophy of lower orbicularis oculi muscle relative to atophy of upper orbicularis oculi muscle. They become prominent after magic epicanthoplasty even without any additional procedure. Epicanthal folds often accompany fine wrinkles and pigmentations on the lower eyelids. Magic epicanthoplasty improve these wrinkles by releasing fibrosis under the skin of lower eyelid. 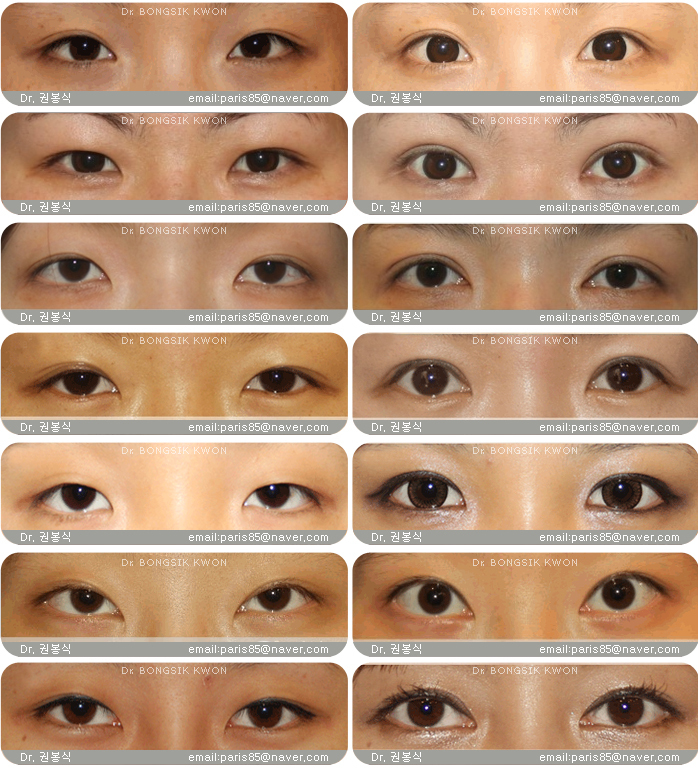 Improvement of eyelid inversion or eyelash prickling . Improvement for dark circlese. This ancillary effect can be achieved by releasing the fibrosis of the lower eyelid. Restoration of horizontal axis of lower canthal line from slanted shape, between punctum and canthal angle. Less sharp eye image is expressed by rotating the inner corner of the eye (eyeline of lower eyelid) horizontally. 09Who or what types of eyes can gain great effects from the Magic epicanthoplasty? When the epicanthal fold directs downward and canthal axis also is also distorted to downward direction. A person who failed in previous conventional epicanthoplasty. 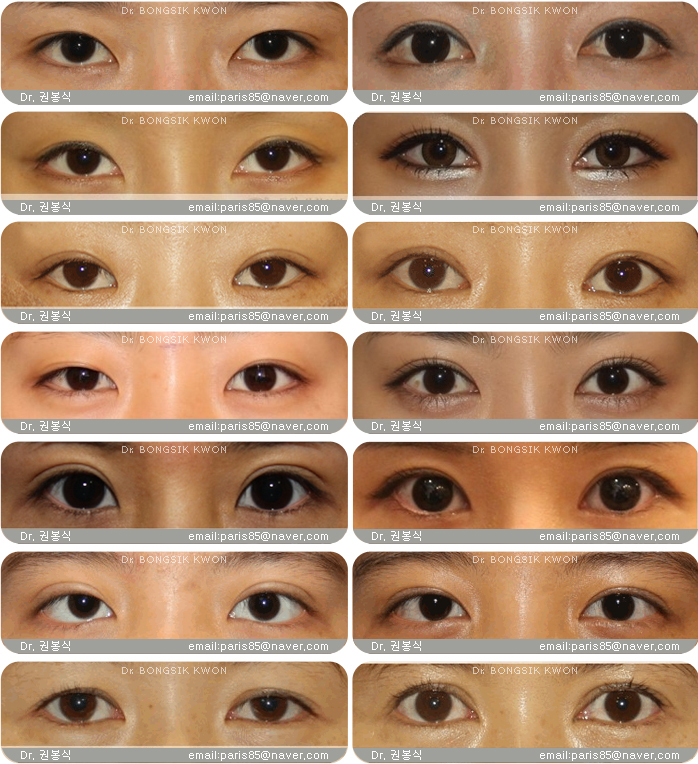 A person who wants to have a natural-looking parallel double eyelid line. A person who wants to obtain optimal result by epicanthoplastyonly. 10Won’t the expression of my eyes look more severe after the magic epicanthoplasty? There is a red flesh, called a caruncle of eye, hidden inside of the epicanthal folds. For Westerners, most of these parts are exposed, while it is partially covered in Asians. Considering the overall shapes of eyes, it is better to be exposed harmoniously. 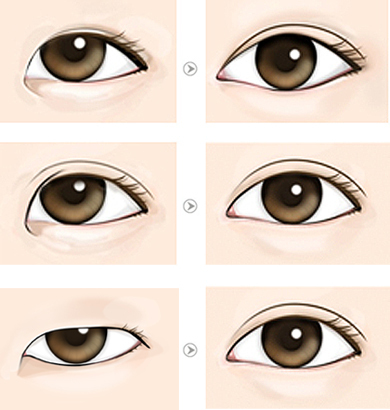 To make big and beautiful eyes, the inner corner of the eyes should be exposed. The inner eyes of most celebrities’ are exposed and they have weak epicanthal folds. 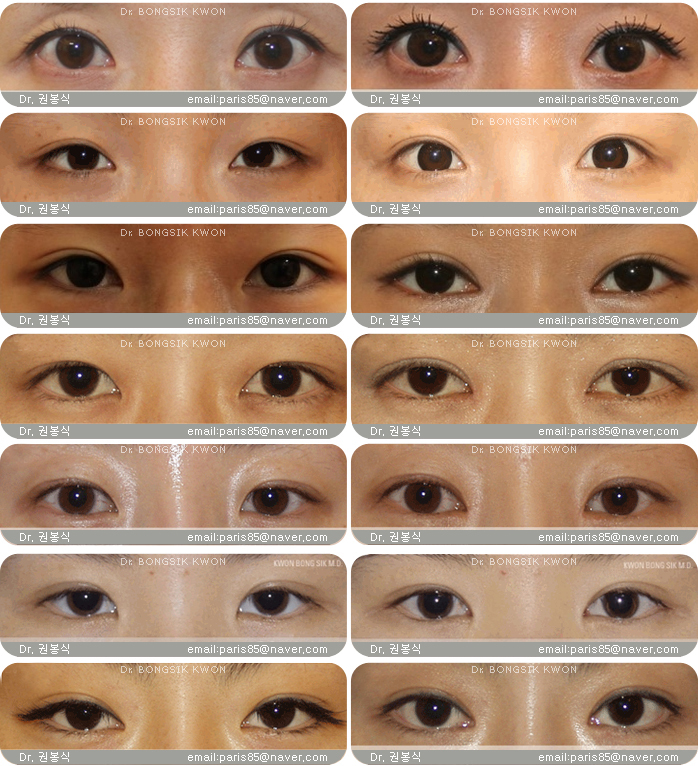 Shapes of the caruncle, the inner corner of the eyes are different in each one, so the degree of the exposure must be considered carefully before the surgery. Example)The caruncles are exposed in significant amount. Example) Only proper amount of caruncles are exposed. 11Won’t my eyes look awkward and unnaturally strange after the magic epicanthoplasty ? Magic epicanthoplasty considers factors such as the condition around the eyes, the exposure of red flesh(called caruncle), the inner-gathering of eyes and so on. So, the results are great while still maintaining natural, oriental attractiveness. There are many other basic factors we must take a close look such as the skeletal structure around the eyes, double eyelids, relation with the nose, and so on. Sometimes, eyes that look similar to a Westerner’s can be expressed if one has a appropriate anatomical condition and when he/she desires it. 12Won’t my eyes look as if they’re too close together after magic epicanthoplasty? Some people worry about whether the eyes will look too close together after magic epicanthoplasty, but one of the most importantly considered points when performing magic epicanthoplasty is the intercanthal distance. It is generally said that it is ideally good when the distance between two eyes is the same as the intercanthal distance. For Korean women, the length of the interepicanthal distance is ideal and looks good when it is about 33-35mm long, but most of them have it over 37mm. There are a few that have a length under 33mm. There’s no need to worry about it in most case. Example) A case where the interepicanthal distance is narrow. Magic epicanthoplasty has an aim not only to remove the epicanthal fold (make the eyes look larger and obtain a more distinct eyeline) but also to make the eyes look horizontal. That is, a person who wants to have a nice looking eyeline (as in the shape of a semicircle,) has to consider epicanthoplasty after confirming the existence of epicanthal folds of his/her own eyes. 13How long does the surgery take? Magic epicanthoplasty is proceeded under local anesthesia. Unlike other existing methods that take usually 20-30 minutes, this surgery takes about an hour because prudential and delicate operational skills are required for soft tissue reposition. We must use fine operational instruments and apply suitable operational procedure according to the patient’s condition. To achieve best results, we must apply proper methods for an individual eyelid according to his/her shapes of the eyes or the double eyelid line, structure of the eyes and nose, the degree and direction of the epicanthal fold, and so on. After taking a rest and cooling down the eyes for 10 minutes, you are ready to go home. Swelling after the magic epicanthoplasty is not severe. As long as you follow the management directions, slight swelling will begin to reduce after 3 days of the surgery. The acute swelling disappears after 5 days of surgery. So it can be said that there is no inconvenience to return your daily routines within a week because the swelling reduces in a short period of time. On the day after the surgery, you must come back to sterilize your eyes and removing the dressings. And from the day after the removal of stitches, washing the face and applying casual make-up is permitted. 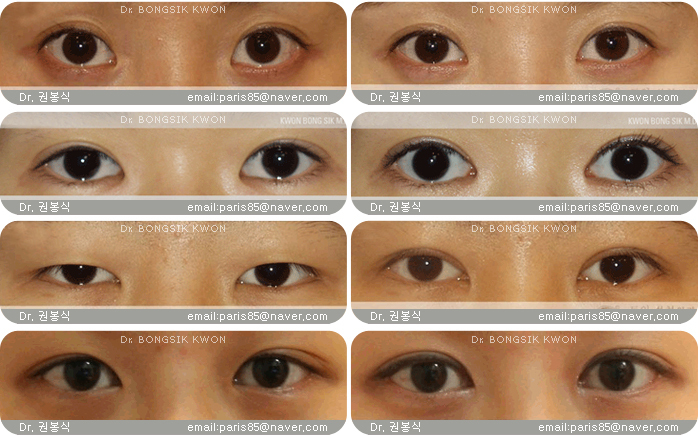 Example) Double eyelid surgery combined with Magic epicanthoplasty (from above, preoperative state, 5 days, 1 month, and 3 months postoperative states respectively). Example)Only Magic epicanthoplasty undergone (from above, preoperative state, 5 days, 1 month, and 3 months postoperative states respectively). 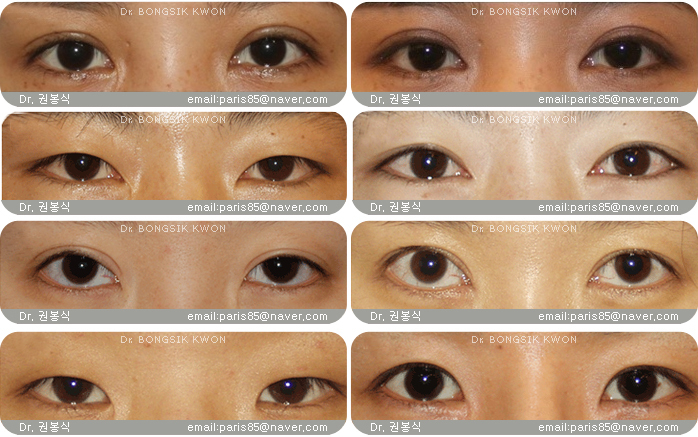 Example)Non-incisional double eyelid surgery combined with Magic epicanthoplasty and lateral canthoplasty (from above, preoperative state, 1 month, and 3 months postoperative states respectively). 15After Magic epicanthoplasty, wouldn’t I really have to worry about a remaining scar? Do I have to take care of it? Most people generally worry about a remainder of a scar. Conventional surgeries may leave you a scar after the removal of epicanthal folds. In that case, a deep scar may remain and it will not disappear . On the other hand, in case of our magic epicanthoplasty, the surgical incision is situated in a hidden place and is almost not visible. Of course it can’t be 100% assured that no scar will be left at all because this is an operation requiring surgical incision. However, it can be insisted that there is hardly social stress to the patients by a noticeable scar. If there is a scar, it will be close to being invisible after 2 to 3 months. The temporary scars during healing period may be covered by make-up of glasses frames, but there’s no need to worry about them because they do not last too long. If a scar still remains after the surgery undertaken previously from another clinic, a steroid injection or a laser treatment is performed for easing the scar for long time . And medicines should be taken if the case is severe. But when one takes the original magic epicanthoplasty from Teuim plastic surgery, there would be no mental stress resulted from a scar.